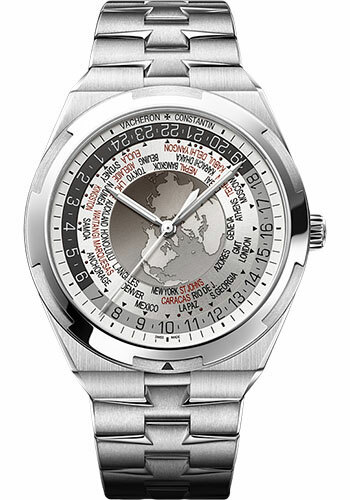 43.5 mm stainless steel case, 12.6 mm thick, transparent back, screwed-down crown, silver-toned triple superimposed dial with map of the northern hemisphere in the center overlayed by a translucent silver-toned disc with city names and then a third sapphire disc with day and night 24-hour inidcations, caliber 2460 WT automatic movement with center seconds, minutes, world time with day/night indication, hours, approximately 40 hours of power reserve, stainless steel bracelet , also delivered with additional black Mississippi alligator leather strap with black nubuck lining and a separate black rubber strap and interchangeable stainless steel folding clasp. Water resistant to 15 bar. 43.5 mm stainless steel case, 12.6 mm thick, transparent back, screwed-down crown, blue-toned triple superimposed dial with map of the northern hemisphere in the center overlayed by a translucent blue-toned disc with city names and then a third sapphire disc with day and night 24-hour inidcations, caliber 2460 WT automatic movement with center seconds, minutes, world time with day/night indication, hours, approximately 40 hours of power reserve, stainless steel bracelet , also delivered with additional blue Mississippi alligator leather strap with black nubuck lining and a separate blue rubber strap and interchangeable stainless steel folding clasp. Water resistant to 15 bar. 43.5 mm stainless steel case, 12.6 mm thick, transparent back, screwed-down crown, brown-toned triple superimposed dial with map of the northern hemisphere in the center overlayed by a translucent brown-toned disc with city names and then a third sapphire disc with day and night 24-hour inidcations, caliber 2460 WT automatic movement with center seconds, minutes, world time with day/night indication, hours, approximately 40 hours of power reserve, stainless steel bracelet , also delivered with additional brown Mississippi alligator leather strap with black nubuck lining and a separate brown rubber strap and interchangeable stainless steel folding clasp. Water resistant to 15 bar.